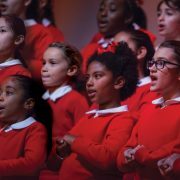 One of our most eagerly anticipated events of the year, the YPC Spring Concert showcases all 400 chorus members in a program that celebrates the coming of summer and honors graduating seniors. 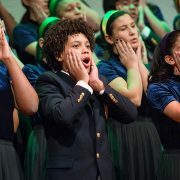 Performances at 2:00 P.M. and 5:30 P.M.
Young People’s Chorus of New York City, under the direction of Artistic Director/Founder Francisco J. Núñez, has been invited to represent the Americas in the renowned Songbridge program of the Tampere Vocal Music Festival. 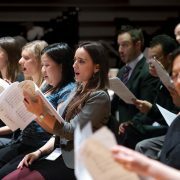 Join YPC’s community choruses—YPC at Washington Heights conducted by Maria C. Pena and YPC at Goddard Riverside conducted by Amber Salladin, accompanied pianist Lee Steiner and percussionist Steve Picataggio— at the Church of the Intercession in Manhattan for this delightful “Songs for Spring.” performance. Donations will be accepted at the door. 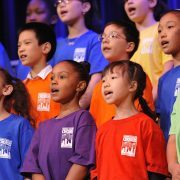 YPC presents the 14th Annual School Chorus Concert on Monday, May 15th at the world-renowned Apollo Theater. Our presentation of “The Tales We Tell” will be in collaboration with our special guests, the Classical Theatre of Harlem, and will combine song, dance and dramatic storytelling. 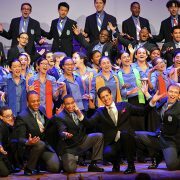 Young People’s Chorus of New York City conducted by Maria Peña join choruses from Japan and the U.S. in a program of international songs. This free concert is being presented to benefit victims of the 2011 Japanese earthquake and tsunami and local and international communities in need. 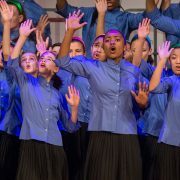 Young People’s Chorus of New York City conducted by Associate Artistic Director Elizabeth Núñez performs a free showcase of high energy music from many genres and countries, complete with show-stopping choreography by Jacquie Bird. 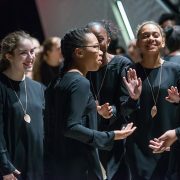 YPC reprises Joan La Barbara’s “A Murmuration for Chibok,” (a YPC commission) at Bang on a Can’s 30th anniversary marathon at the Brooklyn Museum. YPC and Artistic Director/Founder Francisco J. Núñez join some of the most innovative musicians of our time side-by-side with some of today’s most pioneering young artists in this incomparable, eight-hour super-mix of boundary-busting music from around the corner and around the world. 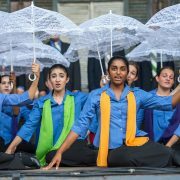 Young People’s Chorus of New York City will open the 2017 OAKE Conference with a public concert. This conference is an annual, countrywide gathering of Kodály educators, students, and guests. YPC Associate Artistic Director Elizabeth Núñez will conduct.